I posted a link to my project pages in the Eagle Tech Forum because it contains some technical information that might be of interest to folks. The interior has quite a bit of finish work to go. We keep upgrading the living area, but, there is a bunch more work to go. 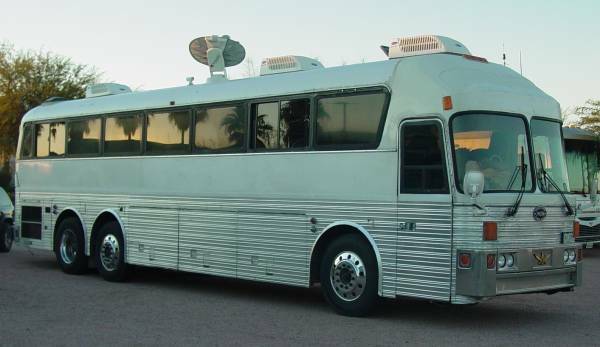 We bought the bus in 2000 and it made it's maiden voyage in March of 2006. As of this writing (10/14/2008) we have driven the bus over 47K miles (without any major problems) and have stayed in the bus 264 nights! For not being fancy, we sure have fun and we feel very COZY in our home away from home. This was a photo taken 12/19/2000 just after I parked it in front of the shop. I had driven it from the Dallas area almost non stop. Yes, that is snow in the picture. This was a Huston Metro bus and they painted the aluminum ship lap siding . This photo was taken in October of 2006. I have made some exterior changes since this photo was taken, but most would not be noticeable to the casual observer. The bus made its maiden voyage in March of 2006 and since that time we traveled just a bit less than 48K miles and spent 270 nights in it (as of 11/1/08). As I said in the first post, it is pretty "plain Jane" but we sure do enjoy our time in it. Even though it is not fancy, we still get a few thumbs up as we travel. I think folks really enjoy the classic Eagle look. Sure does look better now the paint on the lower half is removed! Thanks for sharing, will look forward to more pics and descriptions. I do check your site, but doing it here is a neat way to show off your project. That means that I no longer have to pay $119 per year for a dyno emission test. There are no restrictions on usage in Colorado. You do have to buy 5 years worth of license, but that was only $607. Good job Jim, now all you have to do is get AARP for it too! Tell me more about the emission test you need for Colorado. . .I probably shouldn't talk so loud, but I'm surprised we don't have it here in California yet. I'd be interested in the high-side of their tolerable emission limits and the remedy if you don't pass. Also, how often do you have to test? I will start another thread later today or tomorrow to talk about this emission testing program. i like the Windows on your Bus, how dos the Inside looking? Your VMSpc looks nice, over this i will have millions Question. Pesche, I installed four RV windows in place of the Eagle Windows (two in front and two at the rear). I had the four windows made to fit in the Eagle opening. I left the other Eagle windows in place, partly because it was easy and partly because I am still playing a bit with the interior layout. Some of the Eagle windows (double pane) are cloudy and I would love to get a couple more RV windows and eliminate the old Eagle windows, but that will not happen for a while.